Every time I’m sitting down after a long day, mind empty but not yet ready to sleep, I take the knitting in my hand and I get reminded that there’s more to yarn than dyeing it! I’ve been working on several projects at once: something easy-peasy that can just keep my hands busy while I watch TV or chat with someone; a longer-term project that will eventually become a garment; and something that truly requires concentration, something that I’ll rip out four times before I settle on a solution and promises real exhilaration once it’s finished, for the hours when I still have brainpower. Bonnie Sennot’s Falling Water. 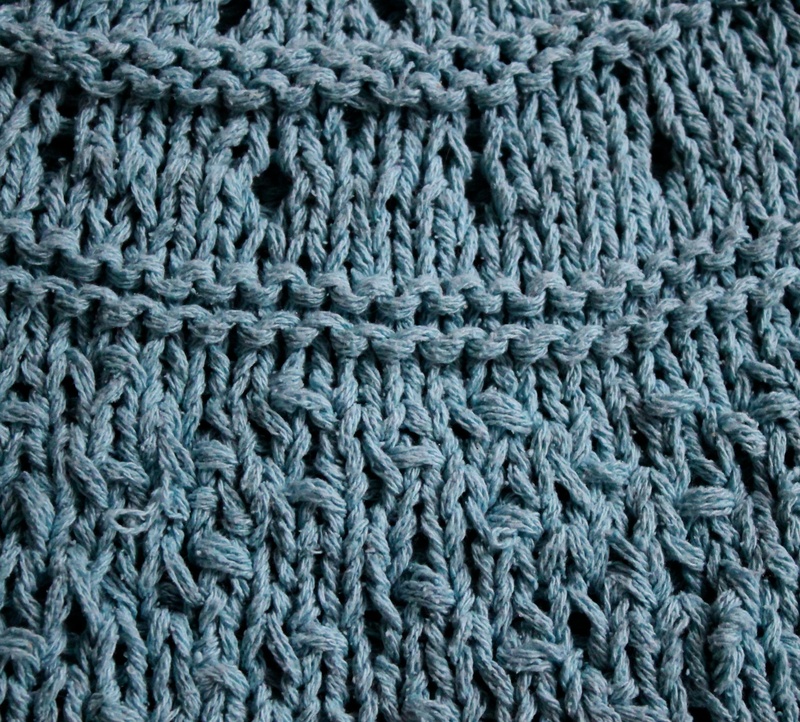 I’ve knit this pattern up once before in my indigo-dyed raw silk, and I love this pattern so much that I keep starting new projects with it. 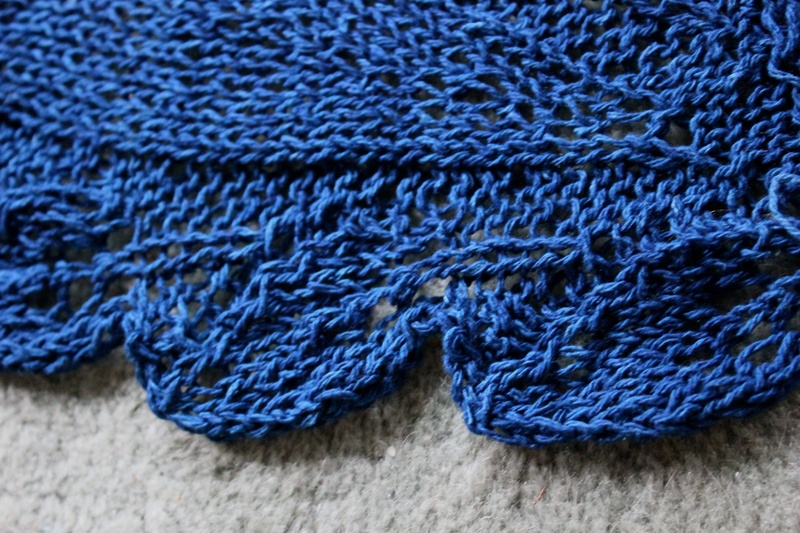 This one’s been modified to make it wider for a truly warm winter scarf. By now I know the lace pattern by heart, I could probably do it with my eyes closed. Well, my apologies for the hyperbole, but I can certainly do it while watching TV; watching a toddler; watching just about anything. I have not dyed this yarn myself. 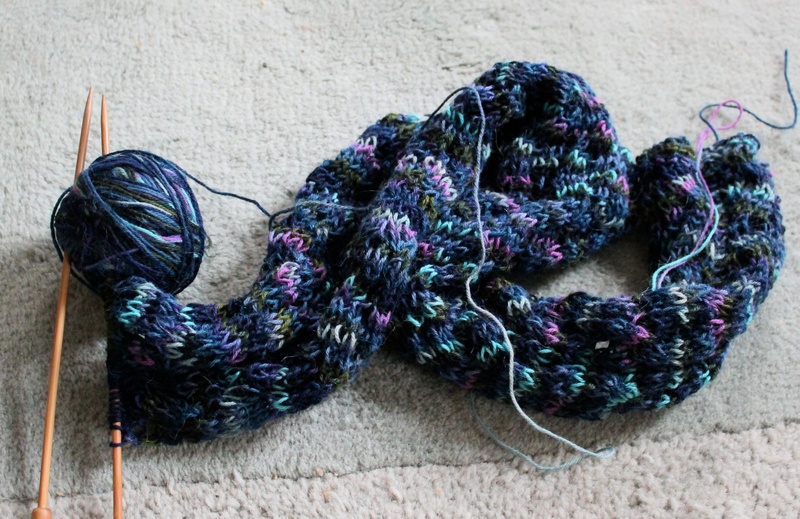 Why knit with hand-dyed yarns made by others when I have pounds of yarn I’ve dyed myself? Inspiration. Staying in touch. Appreciation for the fabulous crafters out there who make dyeing such an exciting and social adventure. I’m still working on this pattern. I wanted to come up with an expressive, yet not too complicated lace pattern that displays the beauty of raw silk. I’ve found a leaf edging in a stitch dictionary, but it only went in one direction, only on the left side of the scarf. I’m working on adapting the pattern to a) reverse the leaf into a mirror image so that it can border both sides; b) develop a system of increases and decreases to make a pointy oval scarf where the leaf vines originate on one end and they meet at the other end. 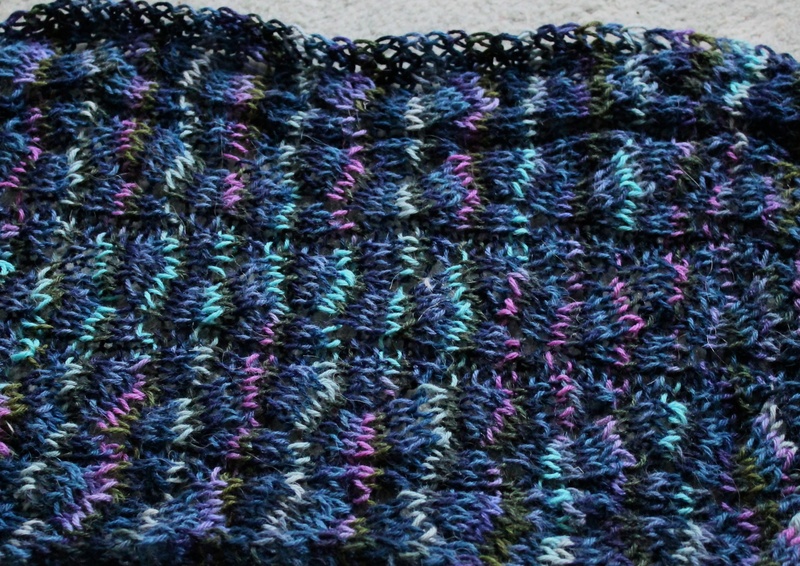 I’ve just enough repeats so the pattern is starting to show, even without blocking. Once it’s finished and blocked, I hope the leaves will start to sing. So I’m doing something I rarely dared do before: showing you my tests! 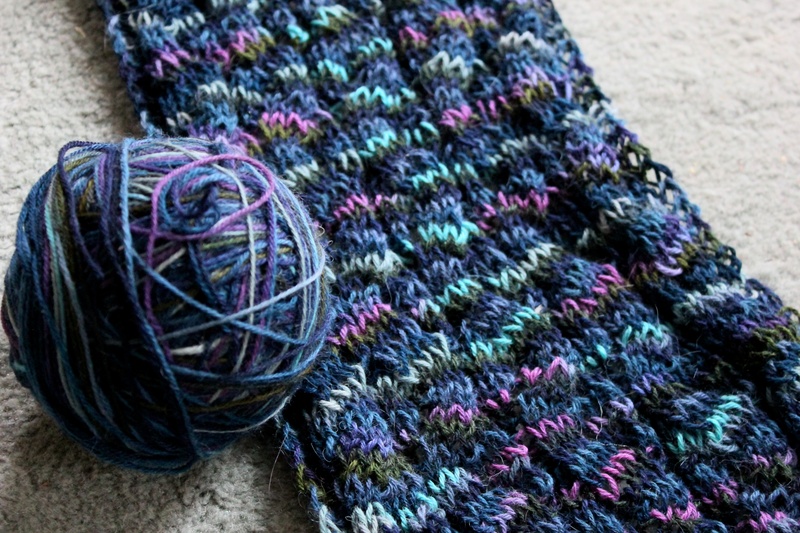 Both testing the pattern, and a gradient colorway Glacier I’m developing for indigo. Hopefully I can offer them soon! This makes my heart sing. 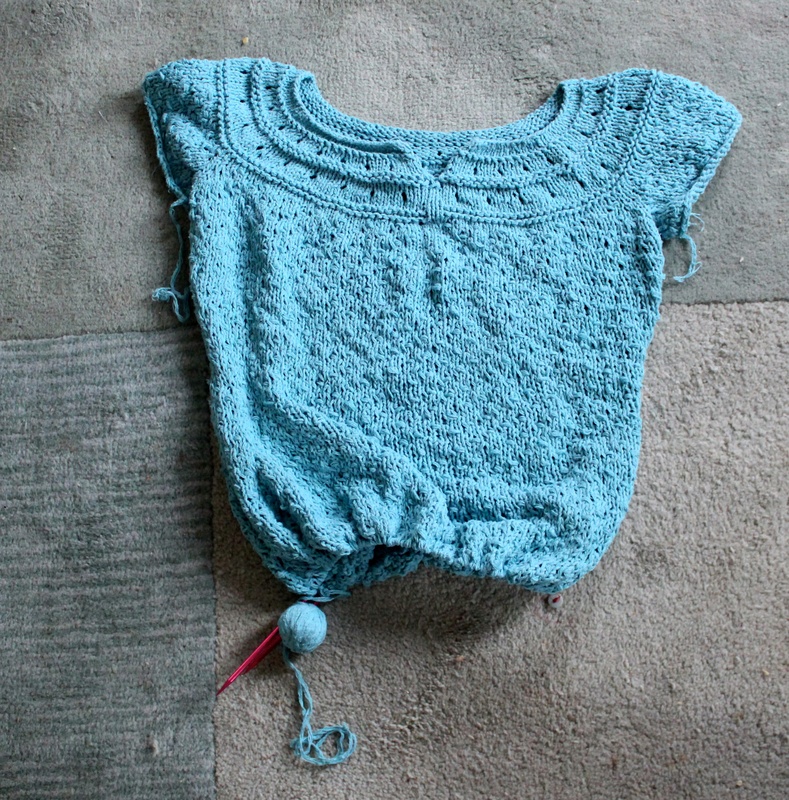 I’ve loved Jennifer Wood’s Raindrop Cardigan for a long time, but what do I use a short-sleeved cardigan for? Sounds not enough on a chilly day, and a too-warm layer on a warm day. So I came up with this: I started out with the pattern as written, but 2 inches after the buttonhole I joined up the two sides and continued knitting in the round. Instead of working straight down from the armholes I I decreased and increased a few stitches to accommodate the waist and hips. Almost finished! 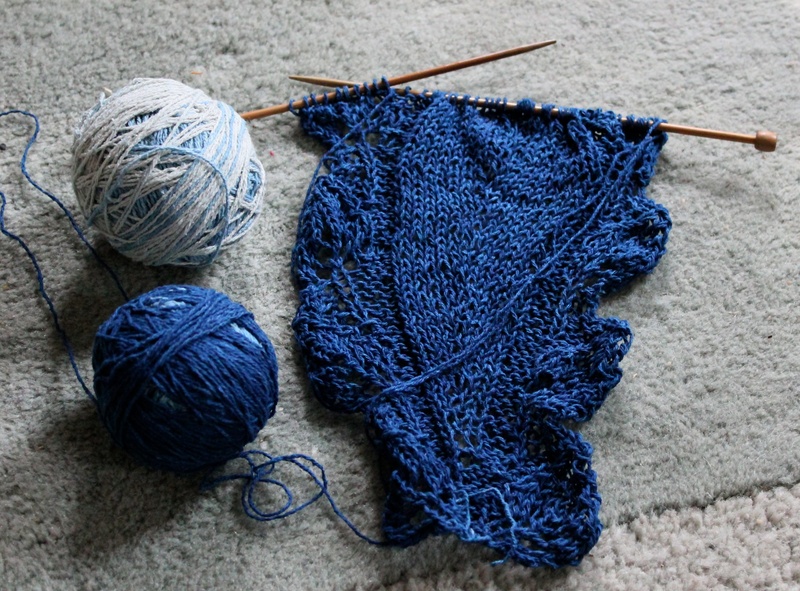 I have no more than 3-4 rounds to knit, then bind off and finish. I’m inordinately excited about this project. Is it because I love starting out with a pattern to give me ideas, but then the real thrill comes from making the pattern do what I really want from it? Or because I love the challenge of recycling yarn? I do find it immensely satisfying when a project from recycled yarn comes out beautiful, funny, interesting, functional. It’s not just the cost saving that makes me unravel old stuff (although that is important, too! ), or the knowledge that I’m doing good for the environment, that it saves raw material, energy, adding less pollution. Even though I get to spend hours and hours in the company of some truly luxurious yarns, the intellectual challenge of matching yarn I already have to an idea that only exists in my head or on paper is almost unbeatable. Maybe only by the challenge of coming up with a new colorway. Now that’s excitement. Beautiful “plate” of knitted goodness. You hit my soft spot with that leave scarf/shawlette! aw, thank you! 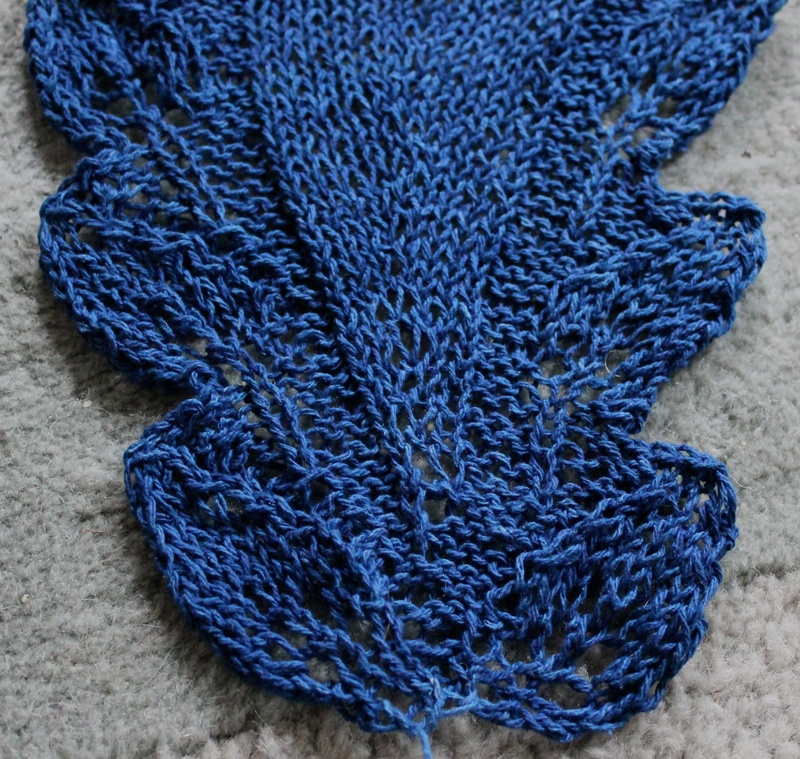 The leaf scarf is almost finished, I’ll be able to share the pattern soon! Hang in there for another week or so. Yeah, recycling yarn is like hand-knitting for me: I do it because I like doing it, not because it’s cost-effective. I derive a strange sort of satisfaction from having rescued something ugly and made it into something nice, no matter the time input. If I considered the cost-effectiveness, I’d never hand-knit anything! 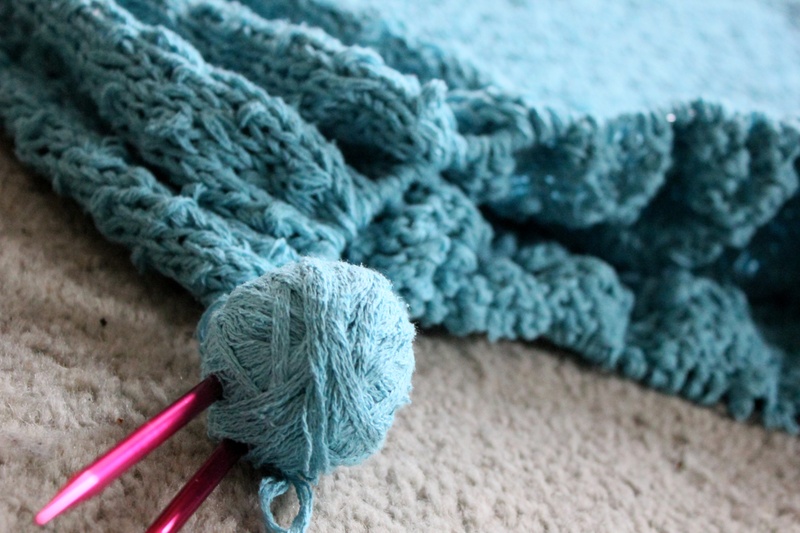 It’s a labor of love, a feeling every knitter knows for sure.